Are you spending as much as twice as much as you did last year to feed your livestock? Are you struggling even to find good hay for your livestock? Have you even had to sell some of your animals because feed is so expensive and hard to find? If the answer to any of these questions is yes you need to read further. We may have a solution for you – aquaponic fodder! OK, what is that? 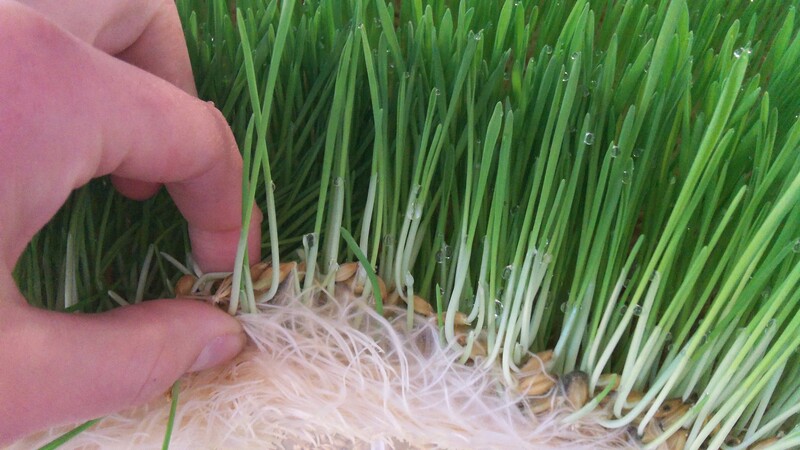 Aquaponic fodder is young green grass that has been grown from grain or grass seeds grown in 6-10 days in a controlled environment using very sustainable and earth friendly technology. 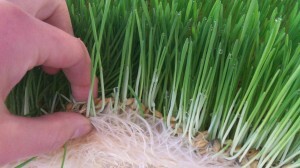 This 6-8″ long green grass is fed directly to your livestock as a replacement for grain and for a significant percentage of your normal hay feeding amounts. We are livestock farmers just like you, and we have struggled this season with our feed needs. We raise show quality breeding alpacas. Proper nutrition is vital to the success of our carefully monitored and strategized genetic improvement program. We are also passionate about using sustainable farming methods in our farming and we want to teach others how to do the same. We have been producing aquaponic fodder here in Northern Colorado at the Center for Ecolonomic Excellence and feeding it to our show quality alpacas. We are very selective about what we feed, and this has been a very exciting addition to our feeding process. We will be regularly reporting on our results with this new technology through our Mountain Sky Alpacas website, as well as through our Nourish the Planet Membership Community. We will be marketing a unique livestock nutrition plan to selected clients which will include an aquaponic fodder program. Watch for all of this as we roll this program out!! Email us at waynedorband@gmail.com or call us at our offices at 303-495-3705 for more information. We look forward to sharing more with you. Livestock feeding does not have to fit the “old school” paradigm that you have always thought about – it can be innovative and sustainable. Your article titled “Aquaponic Fodder” is very interesting. I understand Aquaponics to be the combination of Raising fish and growing veggies. Do you use fish in your system to grow fodder? How about adding ducks to an aquaponics system? What grasses would grow under those rich conditions?